Jessica attended a nursing program with stellar faculty and great internships. She had always heard, "if you don't document, you will get in trouble". No one could explain what that meant. During her orientation as a new graduate, her preceptor taught her how to document the unit requirements and reassured her that writing much more was a waste of time. Jessica never questioned otherwise. At this time in her career, Jessica was thinking... "I don't worry much about charting; the computer takes care of that. As long as I chart what my unit audits for, I can sleep soundly." 2 years later... Jessica sat down quietly at the deposition table, her head hung low and she hadn't slept in months. They asked her to say and spell her name for the court reporter and she was sworn in. "Do you promise to tell the truth, the whole truth and nothing but the truth?" 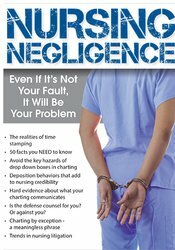 Healthcare today is rife with litigation against nurses. There is more accountability, reliability, autonomy, and liability. The rate of nurses becoming part of lawsuits is steadily on the rise. Watch Brenda Eliff, for this interesting and intriguing look into nursing documentation. This intense recording will immerse you into the world of nursing from a litigious viewpoint. Nurses completing these self-study materials will earn 6.3 contact hours. Expires: 9/20/2021.